If you’re someone who has a garden or yard they take care of, you know it’s no simple task. There are things to cut down, mow, trim, prune, and more, as well as various loads of dirt, mulch, plants, and everything else that you have to cart around. For most gardeners, the traditional way to get all of these jobs done is with your standard garden wheelbarrow. They’re bulky, they can carry a heavy load, and with their wheels, they make it easier to carry than on your own. Anyone who’s used a wheelbarrow will know they’re not without their faults, though. Just one wrong move and your entire load can be tipped over, they’re still quite heavy to carry, and they simply weren’t made to go over rough terrain and keep their balance. Gorilla Carts has solved this problem for gardeners, or anyone who likes to get stuff done around their home. 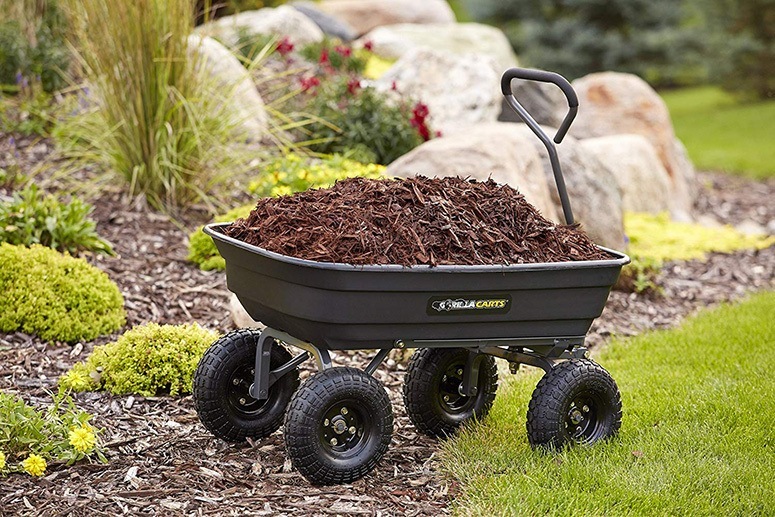 Their range of carts are made to be tough, steady, and handle all kinds of terrain, and we’re here to find out if their products can live up to the hype, especially their popular Garden Dump Cart. Gorilla Carts is a brand that was made by serious gardeners for serious gardeners, and every single design feature in their products is proof of this. Their aim as a company is to create the highest quality gear that makes gardening or tidying up around your home a breeze, and they do this with their range of carts and accessories. The Gorilla Carts Poly Garden Dump Cart is just one of their innovative carts in this range but it’s easily their most popular. 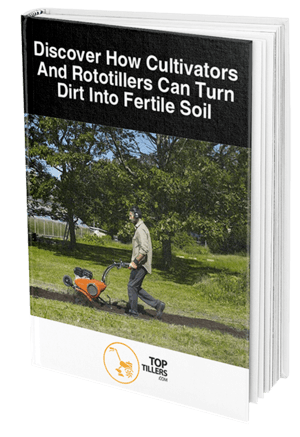 This is the ultimate product for anyone who’s tired of struggling with their wheelbarrow or just wants to make gardening more enjoyable for themselves and easier to do. ​​​​​​This cart was designed for anyone with a garden of any size, there’s no need to be an expert green thumb just to get some use out of it. You’ll save strain on your back, hours of lifting heavy loads, and will actually have fun moving it around the garden and putting it to work. Thanks to the heavy-duty materials and construction, it’ll be a garden companion of yours for years. Gorilla Carts makes their products with ease so that there’s minimal fuss moving the cart around the garden. With large pneumatic tires, you can go over virtually any terrain and there’s no need to worry about it tipping over and having to fill the load up again. Once you’ve used a Gorilla Cart you’ll never want to look at your old unsteady wheelbarrow again. 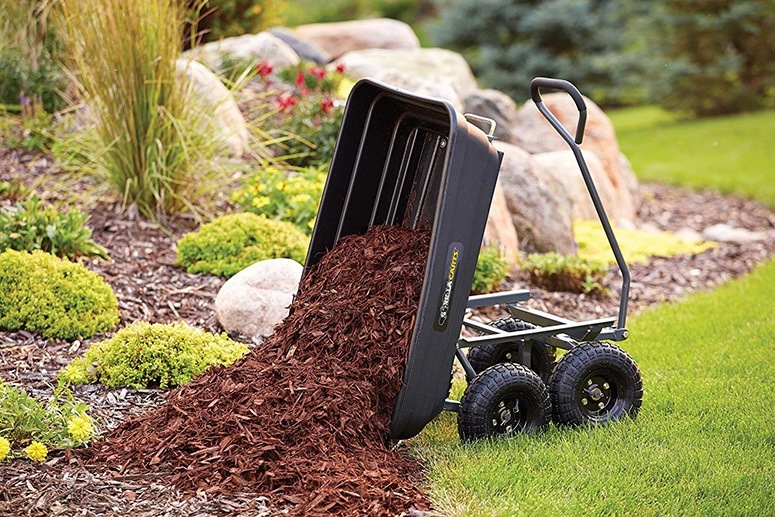 One of the coolest things about this cart, and something you won’t find on your regular wheelbarrow is the patented dump feature. This means you can easily drop off loads with ease and make even lighter work for yourself in the garden without any bending or heavy lifting. The own downside of this cart is the assembly and you have to be prepared to put in some work to get it set up. There are quite lengthy instructions that come with it and it’s not going to be a breeze for everyone, so if you’re not mechanically minded you may need to enlist help to set it up. Once assembled, you’ll never have to worry about it again, so the painful set up is definitely worth it. To get yourself a Gorilla Cart and see what all the fuss is about, head to Amazon for their entire range. You can get the Gorilla Carts Poly Garden Dump Cart for under $70 which is amazing value when you think of how much work it’ll do. This comes with a current discount of around 40% as their usual price is over $100 so it’s a great time to add one to your collection. This is a pretty sturdy object and the freight on something like this would usually be quite a lot, but when you purchase through Amazon you’ll get to benefit from their free shipping bonus. If you’re a member of Amazon Prime then it’s even better, because your free postage will be sent express. This means that within just two days you’ll be enjoying your Gorilla Cart in the garden. Gorilla Carts offers a one-year limited warranty on their product which is fairly reasonable. Feeling how sturdy it is there’s no doubt it’ll last longer, but just to be on the safe side you should store it away out of the weather whenever it’s not in use. 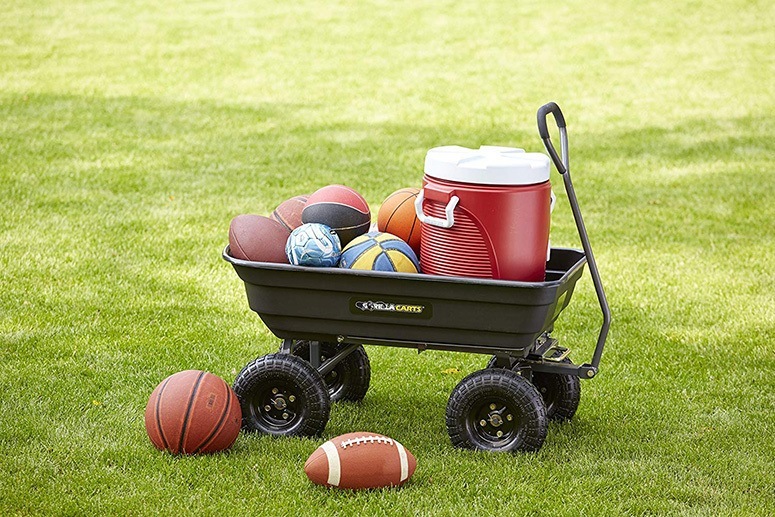 Just like a wheelbarrow though, this cart will no doubt be working in your garden for years to come. 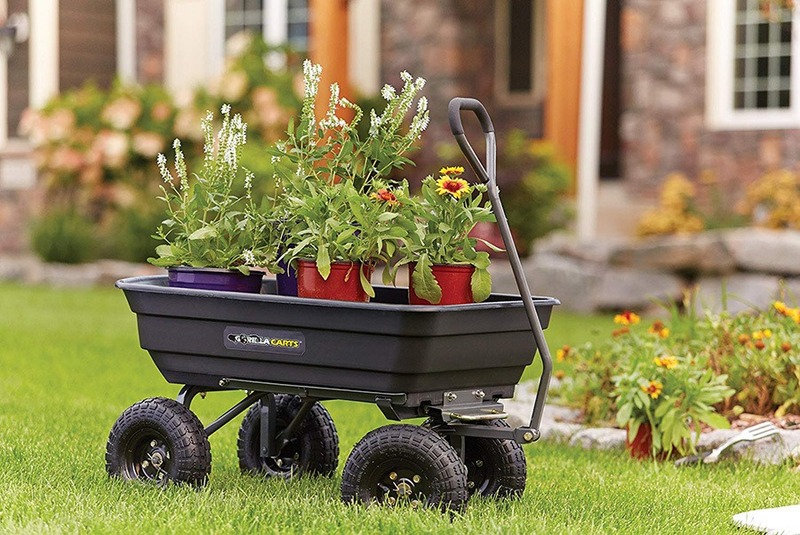 If you’re sick and tired of trying to maneuver a wheelbarrow around the garden or carrying heavy pots and plants back and forth, the Gorilla Carts Poly Garden Dump Cart could be the answer to your prayers. This sturdy and reliable cart is made for the garden and uses high strength steel and heavy-duty plastic to get the job done. This is one of those dream products that you’ll wonder how you ever lived without when you see what it can do in the garden. To get yourself the Gorilla Carts Poly Garden Dump Cart and make your life a whole lot easier, click here to check them out.